Custom Payment Gateway Plugin & Integration Development Company in USA. Nowadays Payment Gateway Plugin Development is on trend. Agile Infoways offers customized solutions for payment gateway plugin development. Our development team is well skilled in handling plugin development for different shopping sites. We are a team of experienced developers who have delivered many such projects with full client satisfaction. Payment Gateway Plugin Development is a little tough task and needs to manage in the right ways. For this reason, you are required to choose the right Payment Gateway Plugin Development Company and get your work done in an expected manner. Agile Infoways is offering customized payment gateway plugin development solutions as per clients’ business needs. Admin will manage the whole payment gateway plugin before he handover it to the client side. There are many important tasks which are being managed by admin in the payment gateway plugin. 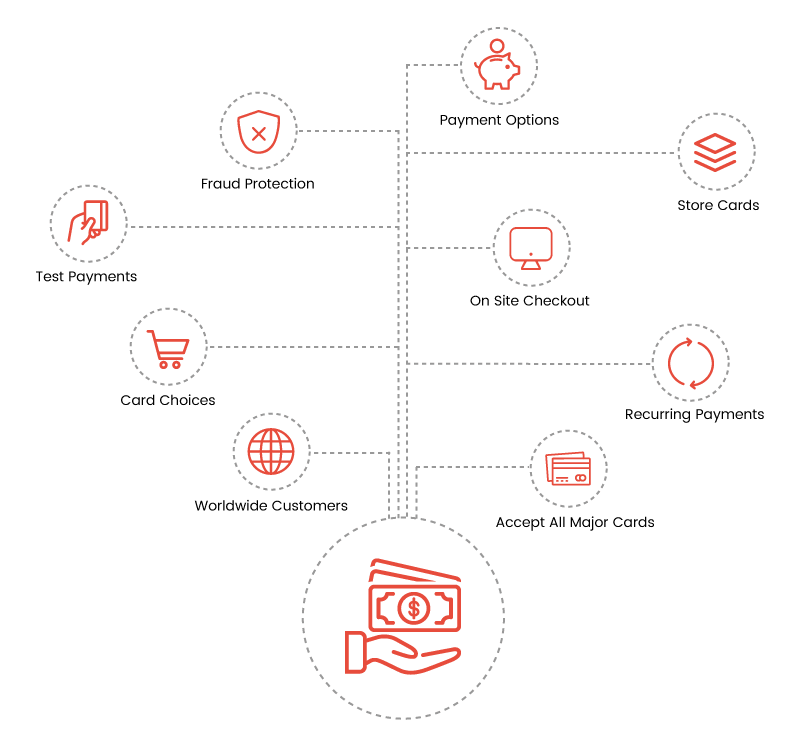 There are plenty of important features in the payment gateway plugin which are highly essential for the safety of customers’ as well as it will boost users’ trust on your website. Admin will enable or disable the payment option as per users’ business need. In this feature, the user will able to perform a highly safe and secure payment. The enable test mode feature provides full testing before we live the platform. Address of customers will get verified and if not matched with the customers’ payment details then the order will get canceled. If the KOUNT feature is enabled then this plugin will check user card details before it goes to the bank. Admin will enable the tokenization feature to save the card details of the user as per customers’ requirement. A fixed payment will get deducted till the user will stop the recurring payment option. There are 2 payment types i.e. authorize will check and place your order & authorize capture will verify your details with the bank and then place your order. A user can add different cards as per their business and these details will be added from the admin side. The payment gateway plugin provides a secure payment process when a customer buys any product from the e-commerce website. Payment gateway plugin has SSL security feature which provides a fully secured payment process that helps the user to protect their sensitive information. Tokenization feature helps to save the card details of customers so that if the customer performs payment process again then it is not needed to fill card details again because his card details are already saved. Will this support Subscription Product? Yes, this will support Subscription Product. What security features this plugin offers? This plugin offers 3D secure and KOUNT feature for the full secure payment process. Does this plugin is available in other platform rather than WooCommerce? Yes, we are offering the same payment gateway plugin development for Magento and Shopify platform both. Does this works with Major WooCommerce Plugins like WooCommerce Subscriptions and WooCommerce Pre-Orders? Yes, we offer WooCommerce plugins like WooCommerce Subscriptions and WooCommerce Pre-Orders.